A combination of cheeses, cured meats and accouterments perfect for game day entertaining. 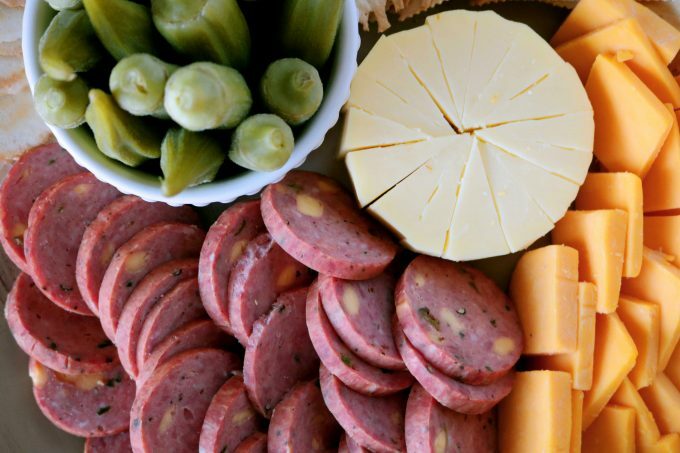 Featuring Cheddar, Colby Jack and Gouda cheese, summer sausage and peppered salami and pickled okra. 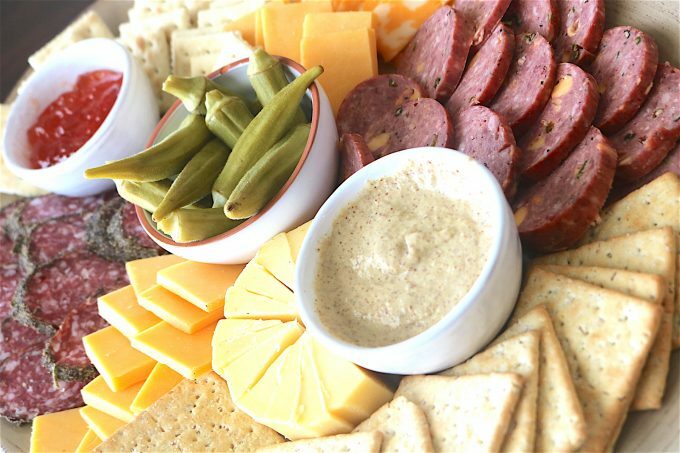 Who doesn’t love a good game day meat and cheese tray? They’re my forever and always a go-to when it comes to entertaining. They are a no-cook, simple, easy appetizer that suits just about any occasion. What is the event going to be like? Is it going to be casual or elegant? Will people be drinking wine, cocktails or beer? Will it be mostly women? Or are the men allowed to come too? And, what about kiddos? Once I have the type of event narrowed down, the cheese selections become much easier. In this case, we are focusing on Game Day entertaining. So the event will be casual, men and children will likely be present, and I think it’s safe to assume beer (for the grownups only, of course) will be the beverage of choice. So now my mind wanders to beer pairings. What cheeses go best with beer and casual entertaining? Cheddar, a super versatile cheese that pairs well with both smoked meats and is wonderful with beer. Colby Jack also pairs nicely with beer and is a touch milder in flavor than a Cheddar, making this a nice, neutral choice for a crowd, and especially the kiddos. It’s customary to have three kinds of cheese on meat and cheese tray. I like to throw in at least one somewhat different, somewhat exciting cheese on a platter. Smoked Gouda plays well with our other cheese choices, and again, would pair nicely with beer. So there we have it. Three kinds of cheese ready for plating…almost. I’ve found that cheese left on the platter whole don’t get eaten, and ultimately becomes a waste. Slice the cheese into fairly thick bite-sized pieces for your guests, and allow for 2-3 nibbles per slice. 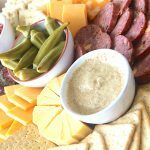 Summer sausage and peppered salami are great choices for a meat and cheese platter, as these cured meats will pair wonderfully with the cheeses above and are overall crowd pleasers. Make sure to slice sausages thin, as they can be fairly chewy. To make your meat and cheese tray extra special, serve up a dipping sauce and pickles relishes alongside it. In this case, a nice strong mustard blend would pair well with the sausage and also cut down on the somewhat “fatty” feel sausage can leave on one’s tongue. Another nice addition, that pairs very well with our selected cheeses is a red pepper jelly. Serve alongside crackers, and encourage your guests to try something new by topping their crackers with a slice of cheese and a tiny dollop of jelly. Everybody loves a little variety. Use an assortment of your favorite crackers to fill the platter. 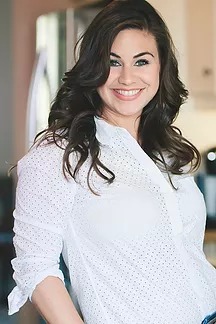 When it comes to meat and cheese tray, I tend to lean toward crackers that don’t boast too much of their own flavor, and go for Saltines, Stone Wheat Crackers, or water crackers. One last addition you might consider is a pickled element such as tiny dill pickles, pickled okra or pitted olives. For plating, start with the bulkiest item, in this case, the flavor enhancers. Place them in small condiment bowls down the center of the tray. Next, add the sliced sausages in a fish scale pattern opposite on another diagonally on the platter. Then, add the sliced cheeses alongside the sausages. Lastly, use crackers to fill in the gaps. MORE CHEESE COURSE IDEAS YOU’LL LOVE! 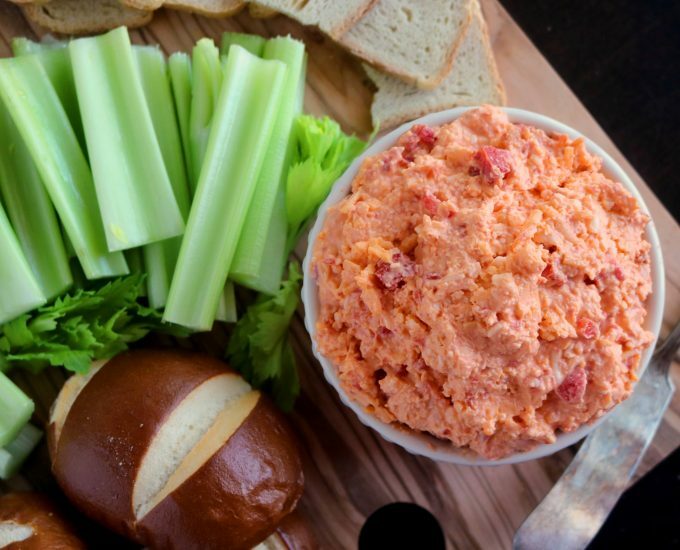 Southern Pimento Cheese is perfect for serving alongside soft pretzel buns, celery, and crackers! Made with real Cheddar, soft Havarti and roasted red peppers, this dip comes together lickety-split in the food processor and is perfect for entertaining! 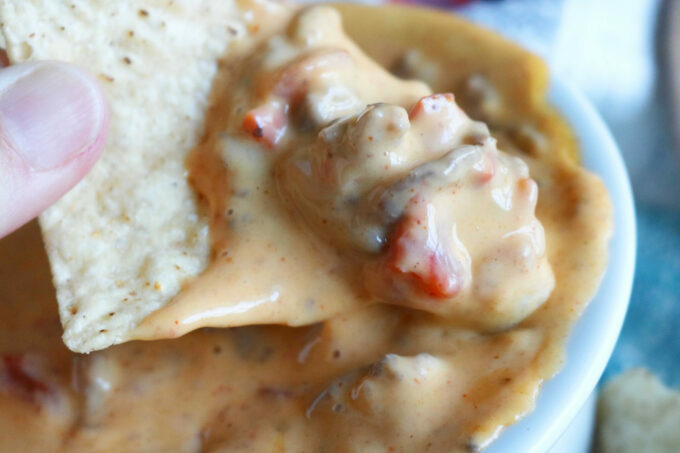 If you’re looking for a hearty dip the crowd will love, look no further than this Crock Pot Queso, loaded with taco seasoned ground beef, tomatoes, chiles, and onion! 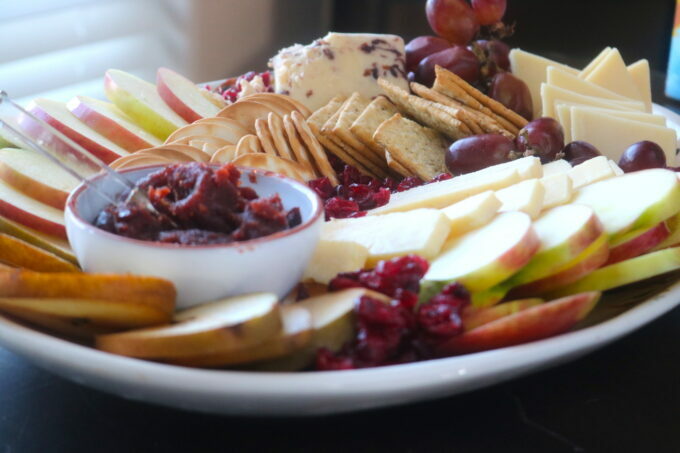 And if you’d like a little fruit with your cheese, it doesn’t get much better than Fruit and Cheese Platter loaded with jam, sliced fruit, fun cheeses, and crackers! Mix together 3 tbsp Dijon Mustard and 3 tbsp Whole Grain Mustard. And, voila! That’s it! Doesn’t get much easier than that. I love meat and cheese boards! They are so easy to put together! I also like all your tips and ideas. Such a wonderful tray! These cheese and meat boards are always a perfect idea for parties and gatherings! Wow, there is something for everyone here. This wouldn’t last long in our house. Great tips for learning how to create a tray that will be devoured in no time! I’ve never tried pickled okra! Must look for that! Thanks for sharing. Thank you, Elaine! We love it!! Such great tips for putting together a meat and cheese platter! I particularly love the addition of the pickled okra. We love meat and cheese trays like this! We always make them for entertaining, but sometimes we do one just for us – so fun! fun ideas I always love these for before dinner appetizers and you have some great appetizers on this tray! Thank you for sharing this perfectly arranged meat and cheese tray. Now I have an idea how to serve my dad’s homemade Salami the next time we have guests. Great varieties on that tray surely looks and sounds tasty! Awesome ideas!